Mr. Steiner formed Steiner + Associates in 1993 with a vision of creating welcoming, sustainable, pedestrian-friendly, Town Center destinations—environments for people to not only shop, but also to live, work and play. Over the past 24 years, the company has turned that vision into reality by developing more than 7.4 million square feet of mixed-use space including retail, restaurant, residential, entertainment, hospitality and office uses. Mr. Steiner oversees all operations, development, leasing and management efforts for the Steiner + Associates and its portfolio. He travels extensively to meet with community leaders and tenant partners and maintains a “hands-on” approach to development and property management. He is frequently invited to address community, civic and professional organizations in the U.S. and abroad to share his unique insights and perspectives into the retail real estate development world. An eager student and ardent admirer of urban form who speaks four languages, Mr. Steiner’s design and development approach emphasizes proper scale, connectivity and inviting and engaging spaces. Parks, fountains and public spaces as anchors are featured prominently in every Steiner + Associates project. The projects are designed and sustained by employing the same fundamental principles of town planning that have created and maintained vibrant urban city centers for more than a century. By seamlessly integrating dining and leisure-time elements into inviting open-air mixed-use environments and public spaces that encourage interaction and exploration, Steiner + Associates has recreated the energy and vitality of those urban centers, while expanding traditional definitions of mixed-use design along the way. Mr. Steiner has held a variety of positions in civic and professional organizations. 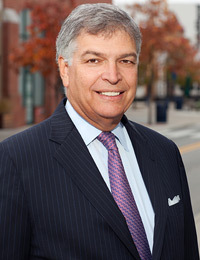 He served as a past board member of the Richard M. Ross Hospital, a past Trustee of the International Council of Shopping Centers, a past Director of the International Council of Shopping Centers Foundation, and a past Board of Trustee member of the New Albany Community Foundation, the Arthur G. James Cancer Hospital, and Richard J. Solove Research Institute Foundation. He has also served as President of the French-American Chamber of Commerce in Houston, President of the Coconut Grove Chamber of Commerce, Director of Greater Miami Convention and Visitors Bureau, and is a past President of the Simon Kenton Boy Scout Council of Central Ohio.